Want to ask me something? You can do so here! To contact me by e-mail, please fill out our contact form and I will get back to you as soon as possible. Please provide additional details here. Please prove to me that you are a human, and not a bot. 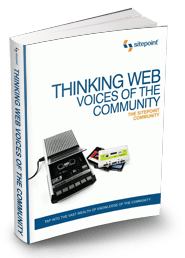 Get a free copy of this ebook offered by SitePoint. Chapter 7 – Make Your Website Stand Out from the Crowd is authored by the Ursula! You have successfully subscribed! Now, your next step is to check your email and please confirm your subscription so that you can download your free eBook!